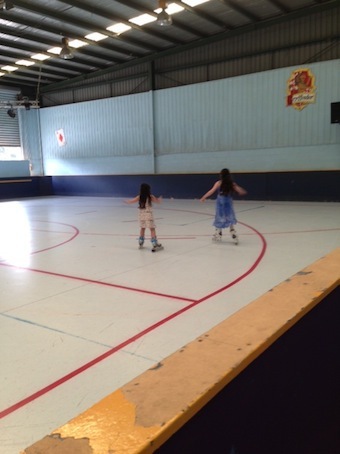 There really is something exhilarating about rollerskating or rollerblading. The promise of speed and freedom, the adrenalin pumping and the feeling of power and strength in your legs. The way it seems to choreograph with any song and the way it takes you from reality to somewhere far away... maybe I'm getting confused with Xanada. Anyway I do love a pair of white lace up roller skates and I do like to think I am graceful and fluent. I'm probably not, but when I skate I skate as if no one is watching, and let's be honest they probably aren't. 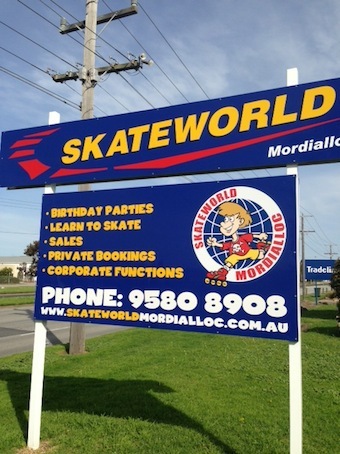 Skateworld Mordialloc is the perfect place to relive your youth or simply get your kids out on the rink. It's a well known, popular spot and people travel far and wide to come here. The rink itself resembles the one from your own youth although it does appear smaller these days but seems to take twice as long to get around it. The floor seems harder than I remember so avoid toppling if at all possible. It's certainly large enough to accommodate masses of happy kids and adults with hours of skating enjoyment and really unless someone accidentally bumps you or takes a dive in front of you, you shouldn't have to dodge too many as you roll around. Hand rails are popular with beginners and the more conservative skater, so you may have to be patient there. The place is filled with top 40 music and you can see and hear the multitasking groovers skate and sing all their favourite tunes. But don't despair if you're not a huge Lady GaGa or One Direction fan as the DJ tends to throw in a few little special songs just for the older audience. I've found myself lip syncing to a bit of Bon Jovi, AHA and Roxette now and then. Sessions are geared at all age and skill levels from beginners to advanced and at all times at least one or two qualified instructors are supervising on the rink keeping everyone safe, picking them up off the floor and hopefully keeping the crowd traveling in the same direction. You can even give the small kids a go as Skateworld allows a 15 minute grace period where they can have a go free of charge and then after a few rounds decide if they want to continue. A cost is only charged if they go over the 15 minute window. Parents can walk with kids on the rink for nothing but be warned, wear boots that cover your ankles, shins and calves, little skates go flying and it hurts a lot. If they decide it's not yet their thing, between the jumping castle, the arcade games and the cafe full of treats, hotdogs, icy crush drinks and dim sims they are sure to be happy enough. Try a C4 coffee for yourself. It's locally brewed and is a fabulously tasty coffee. Every half an hour or so the DJ will call a game. For the more competitive there's speed skating, limbo, frisbee or Corners. 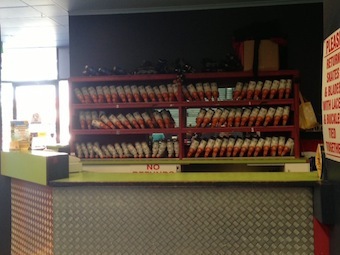 Lucky winners receive a small lolly prize or an ice crush drink. For the others this provides a perfect opportunity to have a drink or food break or just to stop and rest. It's really a physically demanding sport, not that you'd think it at the time but wait til you feel the burn the next day. Skateworld is the one stop shop for all your skating needs. You can hire skates or blades for a mere $4. They certainly do the trick for the occasional skater but make sure you have high socks to stop rubbing on ankles and legs. However if you think yourself or your kids are likely to enjoy the sport and do it more religiously, I would highly recommend you buy your own wheels and you can do that from specialist stores or on site at Skateworld. For a little foot a good pair will cost about $120 plus and a bigger kids foot about $150 plus. 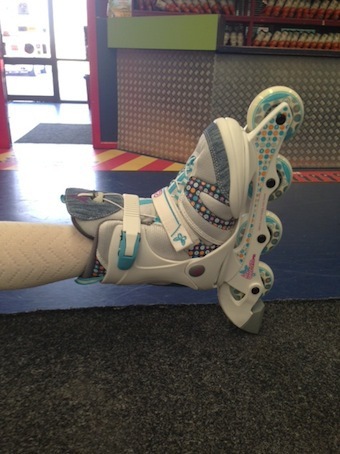 Kids skates are adjustable for maximum wear. There are also lessons you can attend to learn some of the basic moves and fine tune other skills. Classes run on Saturdays from 12-12:45 and you can just show up, no prior booking necessary. Qualified instructors work with the group and help out individuals to progress and get the most out of the session. Afterwards skaters can have the rink to themselves to practice up until 2pm when doors open for a general skating session. On Friday and Saturday nights this place really comes to life with the ever popular Family Disco Night. They're run from 6:30-9:00 and operate like any other family orientated session but with disco lights and lots of swish outfits out on show. The cost is the same and on the first Saturday of the month there's free face painting as well. However this isn't your typical star on the cheek but proper mouth dropping designs that you would expect to pay premium for. It's a really good fun vibe and a huge hit with scout, youth and school parties. Speaking of parties, why not have a rollerskating birthday? My kids love coming to party here and parents can kick back for 2.5 hours as there is nothing they need to do. All catering, including cake if you choose, is included as well as a host who keeps kids busy with games. Please call reception to make a booking. 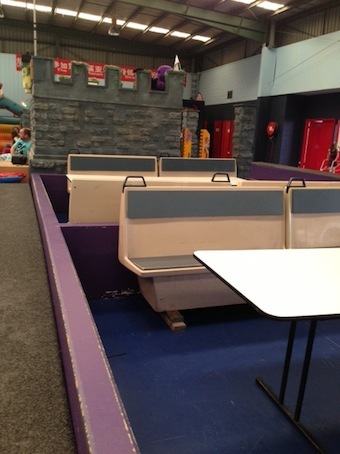 With school holidays approaching faster than imaginable and Melbourne's unpredictable Spring upon us, Skateworld is a great spot to keep in mind when the cries of "I'm bored" ring out. This place will have everyone smiling, singing, sweating and skating. When: General skating sessions are Wednesday 4-6 and Saturday and Sunday 2-4:30 Family Disco is held from 6:30-9:00 on Friday and Saturday nights. Cost: Admission is $13. Skate hire is $4. Admission is only $6 on Wednesday afternoons.